The bedrock of Skåne, the southernmost province of Sweden, has been targeted for geothermal feasibility studies since the late 1970s. An exploration project concerning the geothermal potential in the Romeleåsen Fault Zone was launched outside the town of Lund in 2001. Besides geophysical imaging of the thrust fault zone, the investigations included drilling and investigations of a 3701.8-m-deep exploration well, DGE-1, with the aim to find > 100 °C warm and hydraulically conductive fractured crystalline bedrock associated to the fault zone. The well penetrates a heavily thrusted and predominantly strongly inclined sedimentary succession in hanging rock blocks along the main fault before entering the fractured crystalline basement at 1946 m, primarily composed of gneiss, granite, and metabasite. This paper represents the first comprehensive description and evaluation of the geological, physical, and hydrological properties of the bedrock at these depths in the Romeleåsen Fault Zone coupled to a geothermal assessment. In addition, the applicability of the four drilling methods used in the crystalline basement section is discussed. The outcome of the DGE-1 well shows significant fracturing in the crystalline bedrock at target depth. The investigations show an average thermal gradient of 22 °C/km, an average heat flow of 58 mW/m2, and an average heat production of 5.8 µW/m3. The values are relatively high in comparison to thermal conditions noted in other deep wells in the Fennoscandian Shield. However, a bottomhole temperature of around 85 °C and insufficient fluid production rate made a commercial geothermal system unviable. 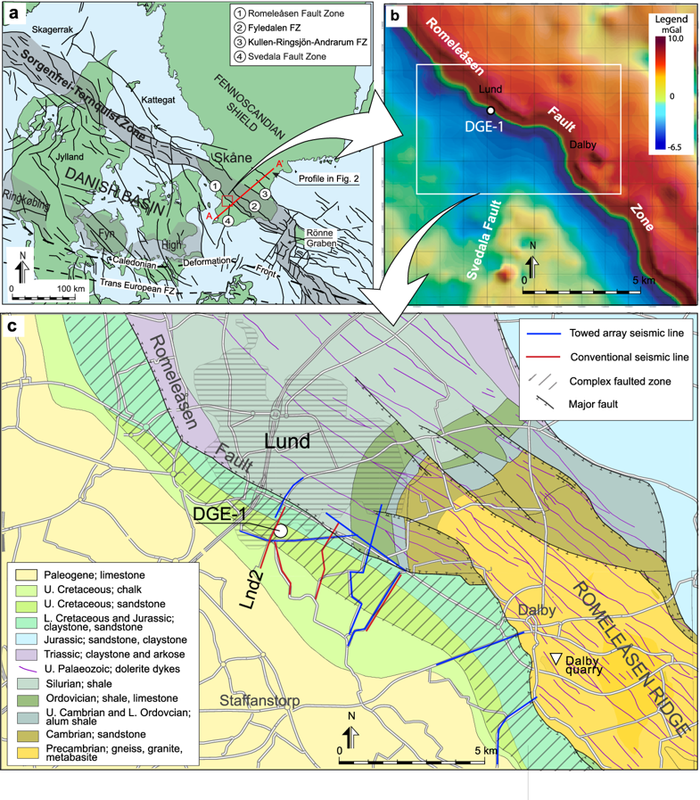 Despite this, the experiences from drilling and investigations of the crystalline bedrock at several kilometers depth constitute important proxies for assessing the geothermal potential in similar geological settings and for engineered geothermal systems in the crystalline bedrock of south Sweden.